The future is taking shape: with more than half of its development time completed, the Porsche 918 Spyder is firmly on course to become the super sports car of tomorrow. 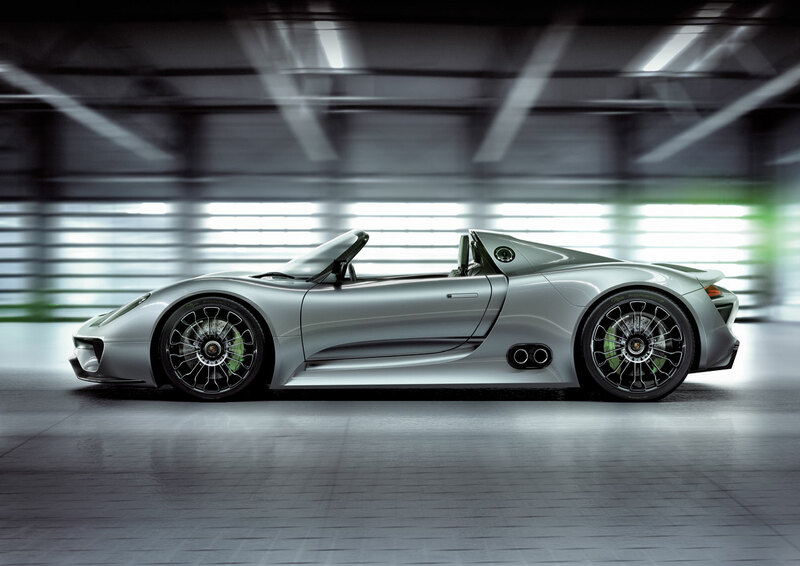 As a plug-in hybrid vehicle, it combines a high-performance combustion engine with cutting-edge electric motors to deliver performance that is beyond extraordinary: the best of both worlds endows the 918 with the dynamics of a racing car packing more than 770 hp of power accompanied by fuel consumption, which at approximately three liters per 100 kilometres, is less than that of most modern compact cars. Moreover, Porsche is breaking more new ground with the technology demonstrator with spectacular solutions such as the full carbon fiber reinforced plastic (CFRP) body, fully adaptive aerodynamics, adaptive rear-axle steering and the upward-venting “top pipes” exhaust system. In the process, the 918 Spyder is offering a glimpse of what Porsche Intelligent Performance may be capable of in the future. 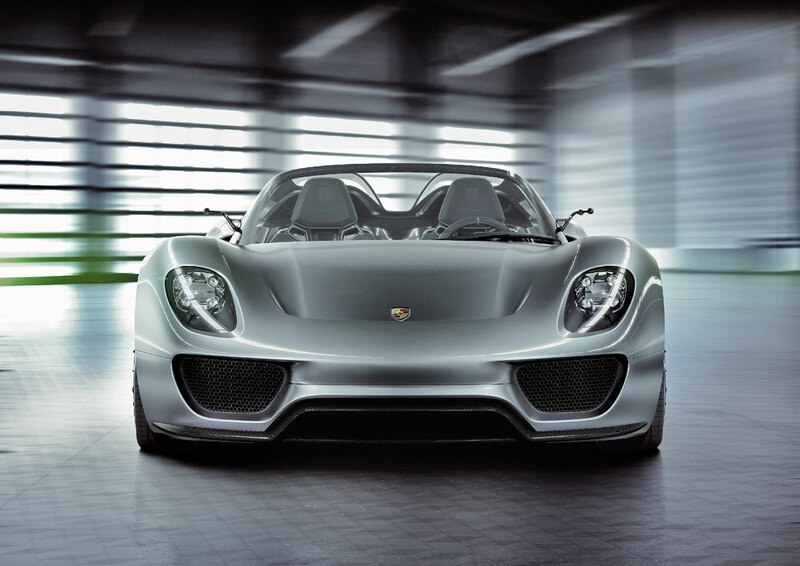 The 918 Spyder has been designed as a super sports car and the legitimate successor to the Carrera GT. As such, the first goal was obvious: improving yet again on the Carrera GT’s performance. As far as is currently known, the 918 Spyder will be significantly faster – both in terms of acceleration and also performance on the racing circuit: less than three seconds from zero to 100 km/h (Carrera GT: 3.9 seconds) and less than 7:22 minutes on the Nürburgring Nordschleife (Carrera GT: 7:32 minutes) is an unmistakable statement. 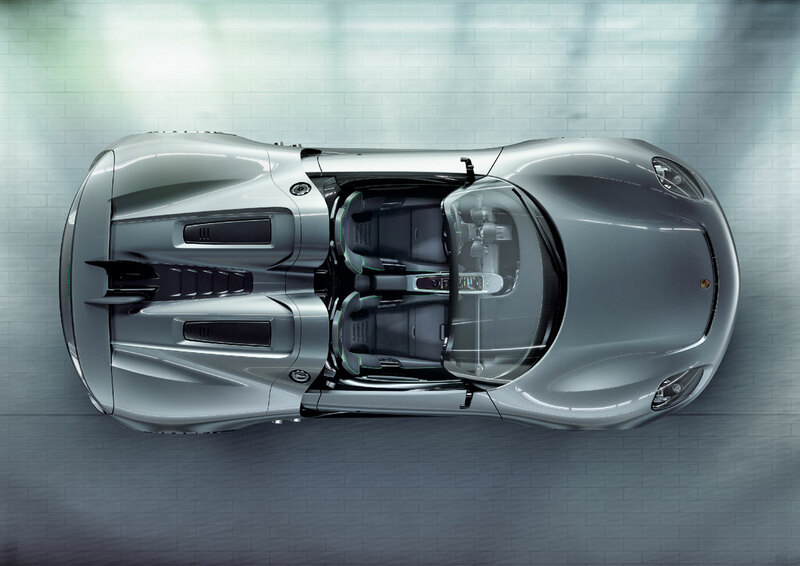 However, the uniqueness of the 918 Spyder is best represented by the union of outstanding performance with a level of efficiency never seen before in the super sports car sector. Fuel consumption of approximately three liters per 100 kilometres and an electric range in excess of 25 kilometres are unprecedented. 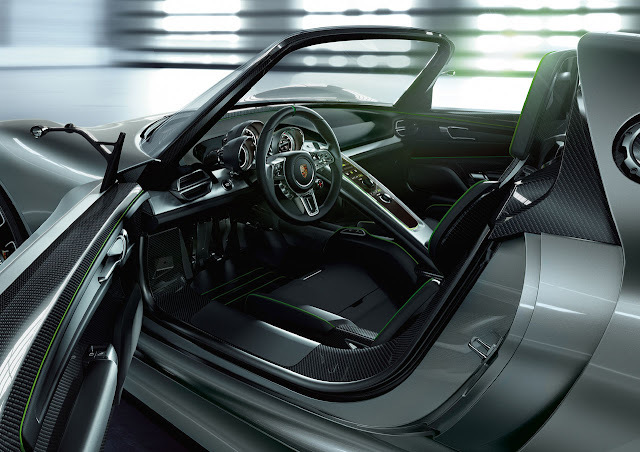 The core of the 918 Spyder concept is the distribution of propulsive power across three power units, collaboration between which is controlled by an intelligent management system using five pre-selectable modes. This operating strategy is a core competency of the 918 Spyder. It takes the best possible account of the different requirements between an efficiency-oriented driving profile on the one hand and maximum performance on the other. In order to make the best possible use of these different approaches, the Porsche developers defined a total of five operating modes that can be activated via a “map switch” in the steering wheel, just like in motor sports cars. When the vehicle is started up, the “E-Power” is the default operating mode as long as the battery is sufficiently charged. In ideal conditions, the 918 Spyder can cover more than 25 kilometres on purely electric power. In this mode, the combustion engine is only used when needed: maximum engine power is available at a moment’s notice by means of the kick-down function. If the charge state of the battery falls below a set minimum value, the vehicle automatically switches to hybrid mode. In “hybrid” mode, the electric motors and combustion engine work together with the focus on maximum efficiency and minimum fuel consumption. The use of the individual drive components adapts depending on the current driving situation and the desired performance. The hybrid mode is typically used for moderate, consumption- oriented driving styles, e.g. in city traffic. “Race Hybrid” is the mode for the highest possible performance and especially sporty driving style. The combustion engine is chiefly used under high load, and charges the battery when the driver is not utilising the maximum output. The electric motors provide additional support as necessary in the form of a boost when the driver requires even more power. The electric motors are used up to the maximum power output limit in order to provide the best possible performance for the race track. In this mode, the battery charge state is not kept constant, but instead fluctuates across the entire charge range. In contrast to Sport Hybrid mode, the electric motors run at their maximum power output limits for a short time, thus ensuring better boosting. This increased output is balanced out by the combustion engine charging the battery more powerfully. The electric energy for the electric motors is stored by a liquid-cooled lithium-ion battery comprising 312 individual cells with an energy content of approximately seven kilowatt hours. 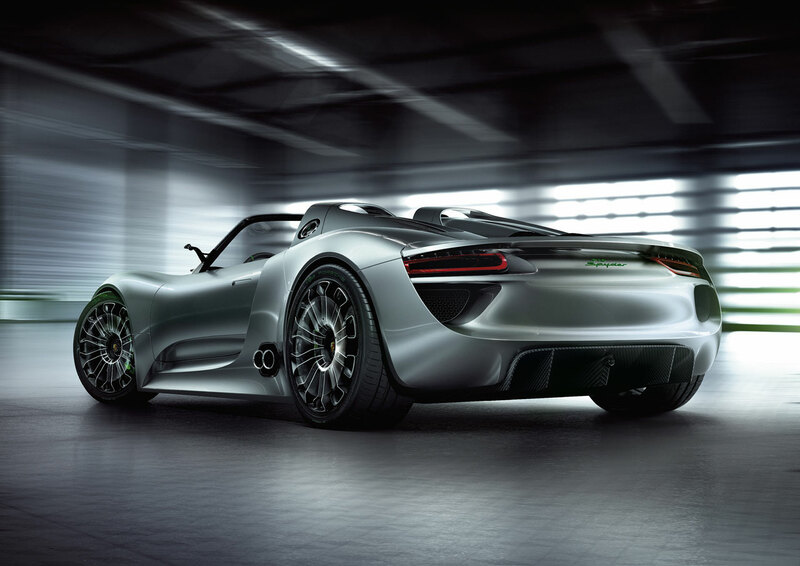 The battery of the 918 Spyder has a performance-oriented design in terms of both power charging and output in order to fulfil the performance requirements of the electric motor. The power capacity and the operating life of the lithium-ion traction battery are dependent on several factors, including thermal conditions. 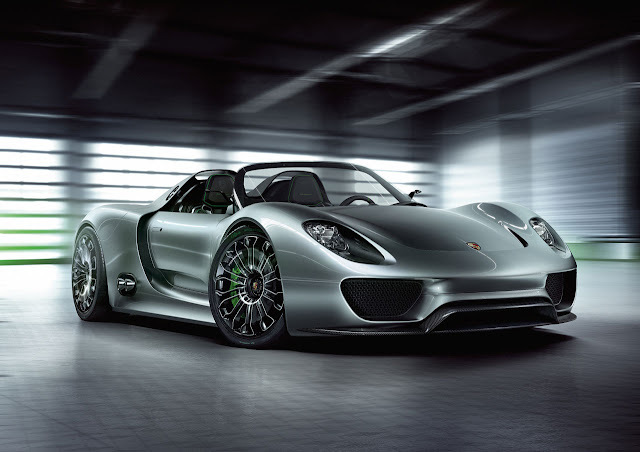 That is why the 918 Spyder’s battery is liquid-cooled by a dedicated cooling circuit. To supply it with energy, Porsche developed a new system with a plug-in charging interface and multiplied recuperation potential. The plug-in interface in the B-column on the front passenger side enables the storage battery to be connected directly with the home mains supply and charged. The charging interface is standardized for the country of purchase. The charger is located close to the traction battery. It converts the alternating current of the mains supply into direct current with a maximum charge output of 3.6 kW. For example, using the charging cable supplied with it, the battery can be charged within four hours from a ten ampere rated, fused power socket on the German 230 Volt mains supply. 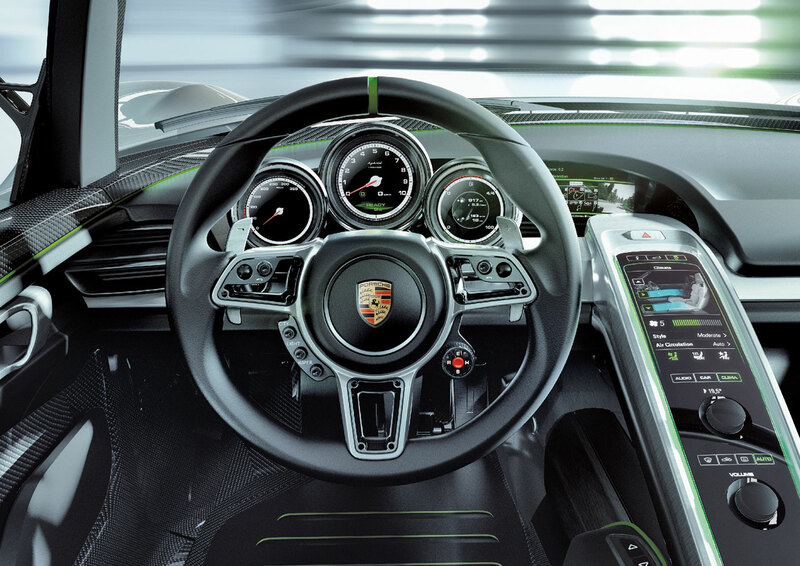 A compact charging station is also supplied as standard with the 918 Spyder. This can be installed permanently in the driver’s garage. It permits rapid and convenient charging within approximately two hours, irrespective of regional conditions.